The strawberries are finally starting to taper off. I've been on a strict every other day picking schedule for the last month, getting at least a 5 quart bowl full every picking, sometimes two bowls full. I'd guess our two rows have given about 60 quarts of berries in the last month, maybe more. I'm still getting a few quarts every other day, but just the right amount to be eating without it being an hour long chore to wash and destem. Which is good because the raspberries are coming on full swing and I don't think that I could keep up with both going crazy! 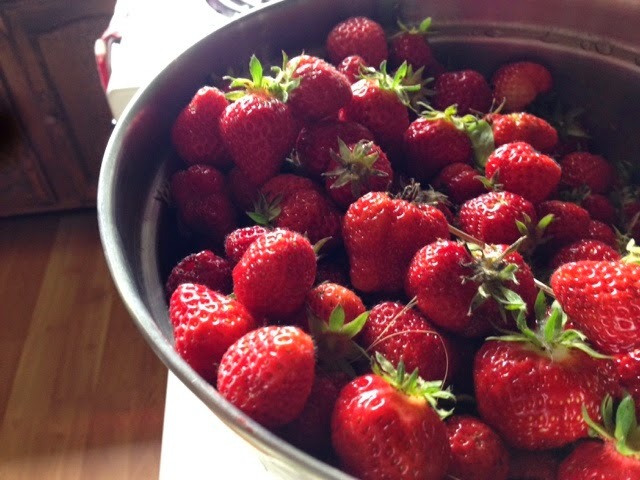 Not to brag, but we are good at growing berries. We could easily grow more, as we have the space and both the raspberries and the strawberries are sending out runners all the time. I love the idea of having more berries, but I don't think I could keep up with the picking chore. It's constant. Andrew and I have been playing with the idea of growing more and letting friends come pick. Maybe pick for free and give us half? Or come pick what you want and share with us from your garden? Because, I'll be honest, while we are really good at growing berries, we are not so hot at growing greens...and I'd like a few more of those in my life!